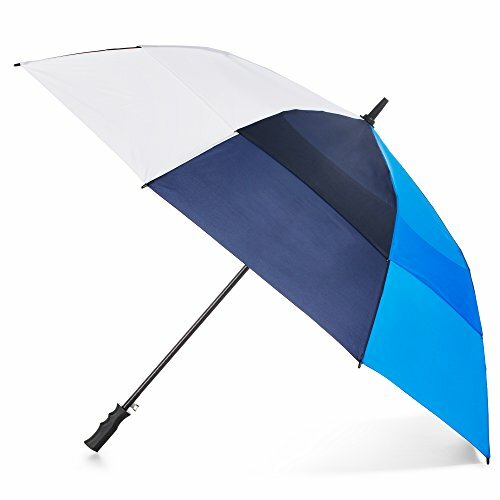 Stay dry on the golf course with this totes auto open large canopy folding golf umbrella. Boasting a 60-inch canopy that's vented for reduced wind resistance, this windproof umbrella is large enough to protect two people from the elements. Plus, with an exclusive NeverWet invisible coating, rain rolls right off and the umbrella canopy stays 4 times drier – no dripping mess! Constructed with a high quality fiberglass shaft and ergonomic handle for easy handling and a secure grip. Auto opens with the touch of a button keeping one hand free when you're on the go.